These furry shirts are just too much fun.. I'm going to have to get one. ^_^ They're also available with wolf, cat, and fox designs, though the design concept does seem ideally suited for us lapines. Disconnect is a free, open-source plugin (Safari, Chrome, Firefox) to block and display the various well-known websites that track your progress around the web, then proceed to sell your data - Facebook's the worst offender, but they're by no means alone. We've all seen the tiresome relaunches of "classic" computing brands, particularly Commodore, where the only connection to their roots is a logo. In this instance, however, it's sort of the other way around - no familiar brand, but a slew of classic game developers, from Atari's glory days, including the creators of Battlezone, Missile Command, Asteroids, and more, corraled together by the co-creator of the Xbox. (Oddly, the company name, at least for now, is dreadfully forgettable: "Innovative Leisure") A somewhat worrisome note, potentially, is the prominence of THQ in the plans, given that studio's considerable troubles, and current retrenchment. Another new face on LJ, whom you may want to follow: pawnytail. The Mollisan Town quartet sounds like a set of books worth a look, even if arguably flawed in their universe's logic. Still, there aren't too many other hard-boiled detective yarns set in a world inhabited entirely by plushies. They're written by Swedish author Tim Davys, published in English by HarperCollins, available in Kindle and hardback editions, with some rather well-designed cover artwork to boot. On the iOS gaming front, two that seem noteworthy: Ghost Trick, which'll be familiar to DS folk - the first two chapters are free, with the rest available in one (quite cheap) bundle, or three slightly higher priced packages; and New Orbit, a sort of Asteroids/physics puzzler set in a horror storyline. Hee! Thanks. ^_^ There was something of a moment there, I think - certainly, far from a perfect image, but given I was resting on a farm gate, hoping I could keep the camera steady for 1/6th (the lens' stabilisation gave out a few months ago, for no particular reason; not very impressive, but less of an issue than the cessation of its autofocus around the same time, so any kind of action shots with the nephews become rather more of a challenge. I doubt it'd be worth repairing; at the long end, the Nikkor 300mm f/4's a world better anyway, and used, something like the Nikkor 18-55 or 18-105 seem really quite decent, and affordable, for about as much as I suspect any kind of repair would cost), I'm okay with it. ^_^ There's something fun about the artificial hues, overlaid on the serene natural tones of the field. Which is, admittedly, a spot I've yet to explore - I've seen a fair bit of the locality, but that field and pathway I just haven't got around to yet. Actually, on the lapine front, I did spot one bun on Friday afternoon, down the eastern side of the hill - but, stupidly, I disregarded the prime directive of wildlife photography: always be prepared. ^_^; I'd been aiming for a bit further downhill, in some open fields, which seemed like possible candidates for bun photography, and where I'd seen one previously, though briefly. So, there I was, sauntering down the hillside, and noticed something. I stopped, looked around, couldn't see anything.. look around further, and spotted a fuzzy grey bun, looking most unsure about the situation, only perhaps 15' away from me. I could've tried getting a shot with the Tamron already attached, but I suspect even that activity, just getting the camera out of the bag, lens cap off, would've been enough cause for them to seek a quieter spot. By the time I got the Nikkor on, they'd made good their escape. Still, given buns don't tend to maintain broad territories, perhaps it'll be worthwhile revisiting. Definitely a pity, as the light and distance might've made for quite a nice shot - I'd have been so pleased to finally get a good daylight bunpic here! 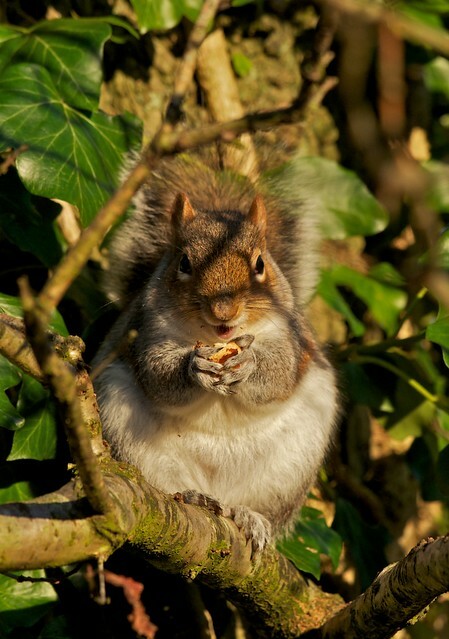 If I went to one of those stock-photo sites and saw that squirrel pic, I would have thought "staged". It's just too perfect! A little closer, and unfortunately, they did decide to scoot - but, I'm thankful they let me so close, and I hope I didn't disturb their repast overly. There's such wonder to behold in the natural world. It's that that I hope to convey, once I finally open the store this Spring - not just rabbits, but rabbits living their lives, as confusing and amazing as they are. I love squirrels. Big floofy tails. FLoof floof floof. Wish I'd got out today for some more photography, but it was much too late a start - only awoke at 1pm. ^_^; I just wish I could locate some local buns who don't keep themselves completely out of view during the daytime. With luck, maybe that'll improve as the days grow longer. Eep! That long? Bleah.. maybe they're having them done in batches? Could well be, given all the on-demand places just use simple transfer technology, which often doesn't seem to last that well. I'd love to see more use the kind of printing that was used in the Associated Student Bodies shirts - I've got a couple that are still good, despite countless washes over eleven years! That said, the Coyote River ones aren't doing badly, though one did spring an armpit hole. =:P Not the best stitching. Ohh, I love all the T-shirt designs, but perhaps wolf is my favourite. Just ran across this, and thought I'd share it. Lovely night shot! It's been ages since I've done night shots myself. I may well try some more night shots in the future, as I now have my tripod again - made sure to pack that into the bag while visiting the former housemate the other weekend. The Tamron's not really an architectural lens, but it works acceptably at shorter focal lengths - it's more at the long end where its resolution limit's more evident, compared to the Nikkor.